What an event. Tons of people, lot of contacts, huge interest. Bigger than ever. Gives confidence! All in all I do not dare to count together the cost of the shown system and I honestly enjoyed it day by day more: it had each day development that brought it more and more in the direction of music. There was lot of people until the latest ours of the Sunday, our room was nearly constantly filled and we hardly come to visit the rest of the show. The feedback of the public was enthusiastic and opened the way to further developments. Sunday evening was a pity to dismantle the system and conclude the show... but now it is time to collect the results. 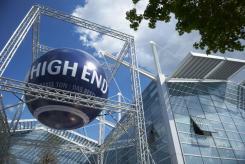 See You in the Munich High End 2015!